My husband loves chipped beef. He loves it over toast. He buys those frozen dinner packages and has them for lunch. Actually, I refuse to buy them for him because of the high sodium content. 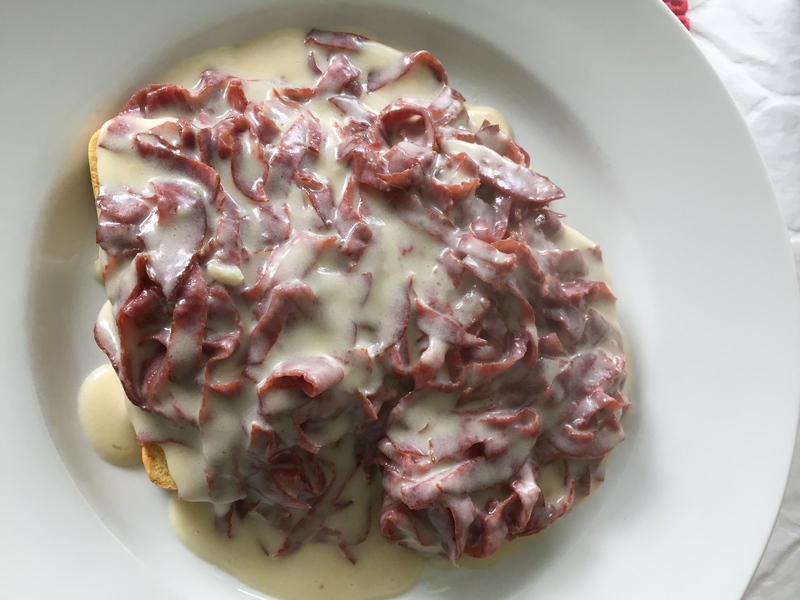 So, talking to a good friend one day, I lamented about how I wish I could make him from scratch chipped beef. Well, lo and behold (as my Mom used to say), she had a recipe. I’ve never purchased dried beef before so she told me you can find it close to the tuna and canned chicken. There it was on the top shelf. This recipe for Week 12 of the 52 Week New Recipe Challenge was a big hit with hubby. Melt butter in skillet and saute dried beef for approximately 3 minutes. Stir in flour and add milk all at once. Cook and stir until thick and bubbly, then cook 2 more minutes. Add a dash of pepper if desired. Spoon over buttered toast. This entry was posted in 52 Week Challenge, Beef, Comfort Food and tagged buttered toast, chipped beef, dried beef, milk. Bookmark the permalink. I’ve never heard of this, but I know my husband would like it, too! Thanks!